Science, as it has in the past, will play a vital role in determining America's economic viability. Yet, our global leadership in this crucial area is more vulnerable than ever. Scientists in the U.S. face major roadblocks: a decrease in federal funding, restrictive policies, suppression of research findings to suit political agendas, to name a few. The excitement to reverse this trend, as promised by president-elect Barack Obama, is palpable. With the current financial crisis and national debt, America can't afford to sideline science. Join us for an advice session to the Obama administration on science and the future of America. 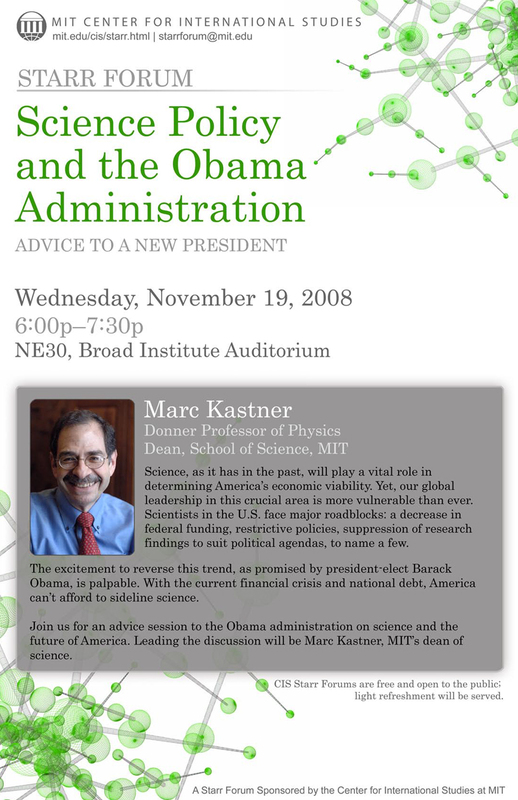 Leading the discussion will be Marc Kastner, MIT's Dean of Science. Eugene Skolnikoff, Emeritus Professor of Political Science at MIT and a former director of CIS, will chair the discussion.